I wrote a bread baking book , so obviously I'm familiar with dough. I haven't bought bread for so long, I couldn't even tell you what a loaf costs. But that doesn't mean I'm totally opposed to shortcuts. 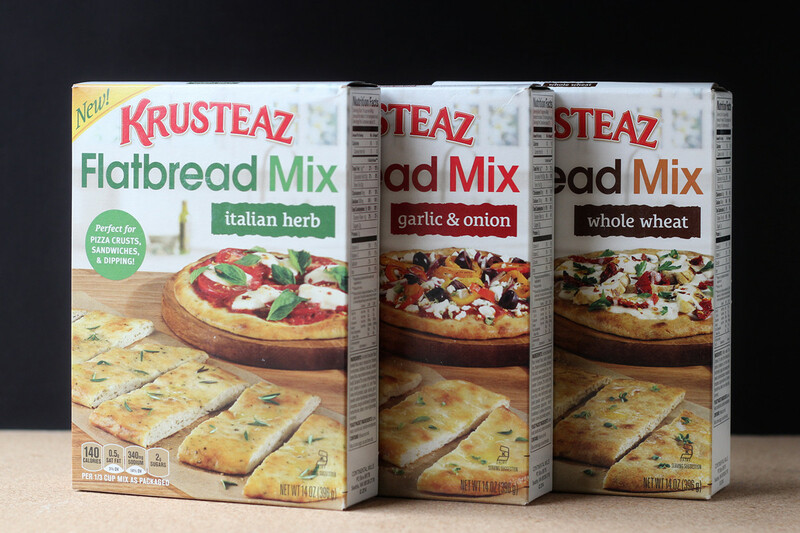 My good friends at Krusteaz sent me some of their flatbread mixes to try, and I was really curious. I like the other mixes I've tried, so I had reasonably high hopes for the flatbreads. What I like about Krusteaz products is that they're reasonably priced, but they still taste good. When I'm testing bakeware, I like to use Krusteaz products because I know that if something goes wrong, it's a bakeware issue and not a recipe problem. I decided to use my stand mixer to knead the dough, although the recipe instructions didn't require it. I mean, I have the thing, so why do it the hard way? According to the instructions, I should have added an extra 1/3 cup of water since I'm at high altitude. But I decided to use the standard instructions and add water if I needed it. Rather than needing more water, I had a dough that was pretty loose and sloppy. To get it to turn into a ball of dough, I needed to add just a tiny bit more flour. But that's no big deal. Any time you make bread, you should feel free to add more or less water, or add a little flour if you think the recipe needs it. 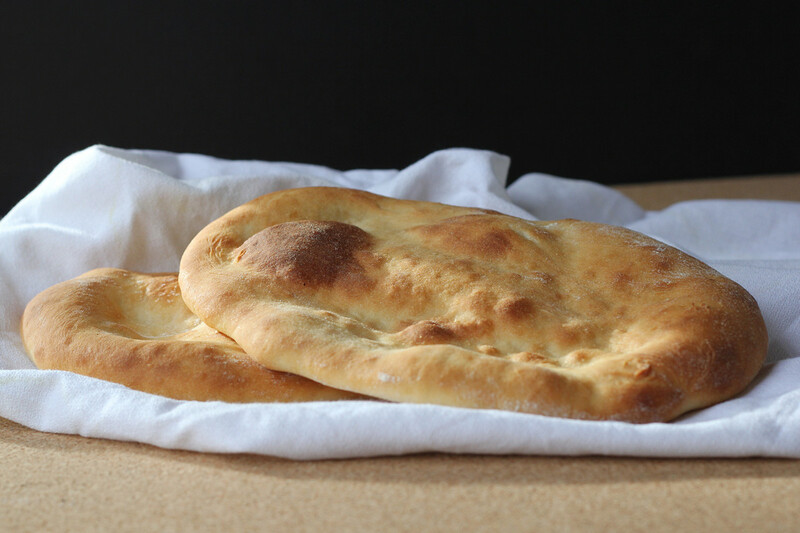 With bread dough, the feel is more important than the formula. And I divided the other half into two pieces and baked them as flatbreads. I decided to use the garlic and onion flatbread, which was pretty tasty on its own, but I loved the idea of using those flavors as a pizza crust base. 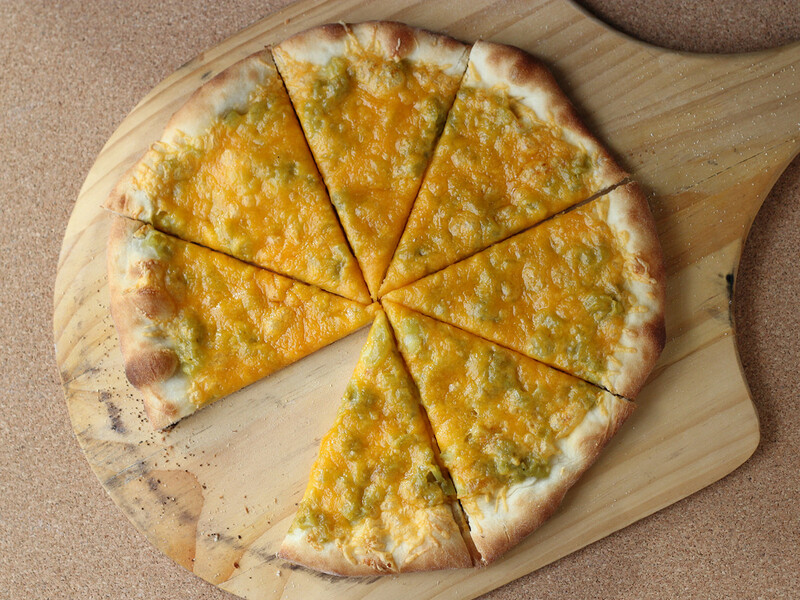 I decided to use non-traditional toppings - a can of mild diced Hatch chiles, and cheddar cheese. The flavors were good, but I have to say that I was really happy with the texture of the crust. The instructions point out that if you want a fluffier dough, you can let the dough rise longer, but I liked the thin crust a lot. Since I baked the pizza first, the flatbreads did have just a little extra rising time, but they also puffed more because they didn't have toppings. If you're looking for a quick, easy way to make flatbreads - for pizza or for other purposes - these mixes are pretty good. Besides the garlic and onion version, there is an Italian herb mix and a whole wheat mix. So far, I've only tried one, but I expect that they'll all be just as good. Disclaimer: Krusteaz sends me products from time to time for my use. I only write about the ones that I feel my audience would be interested in. Happy Thanksgiving! Want a gift card?